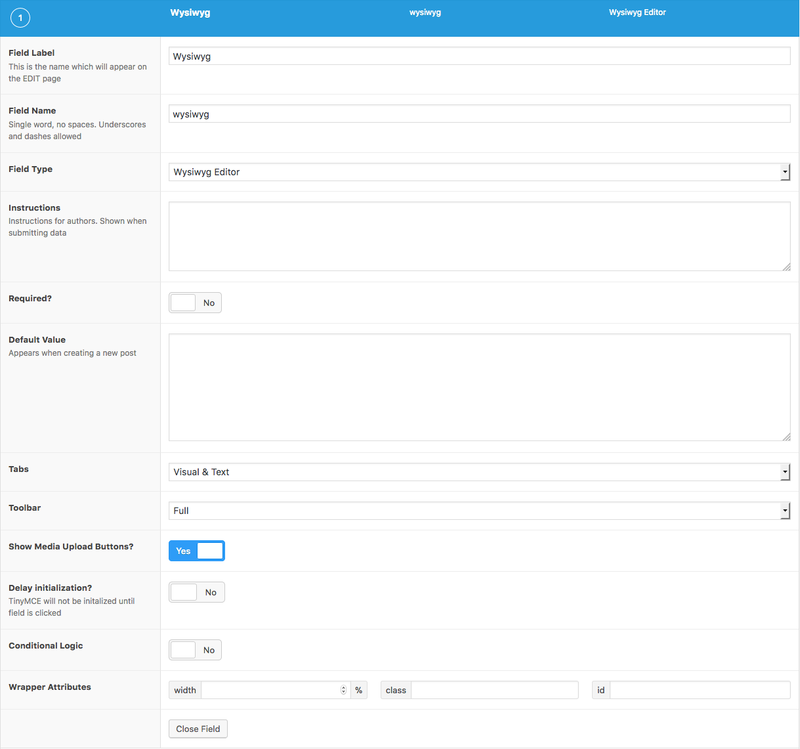 The Wysiwyg field creates a WordPress content editor in the typical fashion used in Posts and Pages. Wysiwyg is an acronym for “what you see is what you get”. This is one of the most useful fields for editing content as it allows for both text and multimedia to be edited and styled within a single area. Tabs Each editor contains a visual and text mode. Select which modes are shown to the user. Toolbar Specify which toolbar to show. The “Full” toolbar reflects the typical WP editor toolbar with 2 rows of buttons. The “Basic” toolbar is a minified single row of buttons useful for more basic text needs. If you would like full control over the toolbar buttons shown, you can also create your own toolbar. Show Media Upload Buttons Whether or not to show the “Add Media” button for this editor. Delay initialization? If enabled, this editor will not initialize on page load but instead require a click before editing can begin. This is useful to speed up load times by avoiding the tinymce JS initialization delay. ACF will return your content formatted for HTML (the same way that the_content() does). The Wysiwyg field does use the the_content filter to format it’s value into HTML. Instead, ACF uses it’s own acf_the_content filter that closely mimics the one found in WP core. If you are using the the_content filter to modify content, please be sure to add your filter to acf_the_content as well. This is to avoid recursion and asset loading issues caused by calling the the_content filter multiple times.